‘Tis the season to be jolly… and to give gifts to family members and friends. 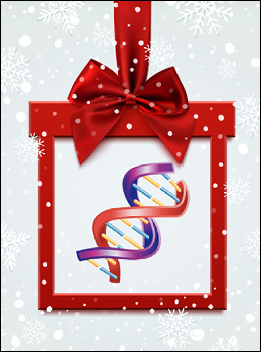 For those who, like The Legal Genealogist, are fans of genetic genealogy, that may mean thinking about buying and giving DNA test kits to kith and kin this holiday season. There are some things to think about when it comes to DNA testing and it’s best to think about them before spending the money on the test kit. There are both legal and ethical issues that can come up with respect to DNA testing that should be considered in advance. First, can you legally and ethically test the person you’re buying the kit for? This really is a serious question for those who are considering tests for the very oldest and very youngest members of the family: those who may not be in a position to consent to the test. Some of our very oldest family members may not be competent, mentally, to consent, due to Alzheimer’s or other age- or disease-related issues. And our very youngest family members aren’t legally competent to consent because of age: the minimum age for legal consent in the United States is still 18 years. For an adult who’s not competent to consent, it’s only the person with legal authority over that adult’s affairs who can consent on his or her behalf. That may be an adult child; it may be a legal guardian with power of attorney. Second, who owns — and controls — the DNA? Even though you’re paying for the test, the DNA data — and the DNA results — belong to the person whose DNA it is. You and your kith and kin can agree in advance on who’s going to manage the test results, and you can certainly agree in advance on who’s going to have access to them, but in the final analysis, the DNA belongs to the person who tested. There’s no wiggle room there. No room for “well, the results won’t mean anything to my cousin.” No room for “maybe my cousin won’t understand them.” No room even for “maybe my cousin doesn’t really want to know what her results show.” So you have to give your cousin access to the data even if you paid for the results. If you’re testing with any other company, you need to think about this issue — and maybe get something in writing from that kith or kin if you want to be sure you’re going to have access in the future. Third, and perhaps most importantly, is everybody prepared for what the test might show? There isn’t a day that goes these days by without a family secret being uncovered by DNA testing. A person believed to be a parent or grandparent is found not to be biologically related to the person tested. A previously-unknown half-sibling or first cousin appears in a DNA match list. A child given up for adoption identifies his or her birth family and seeks contact. Is the test taker aware of these possibilities? Is the family prepared for them? Really prepared? Have they talked about it? Considered what it will mean if the test does produce an unexpected result? These are all important questions. A current book by TV anchor Bill Griffeth, “The Stranger in My Genes,” demonstrates exactly what can happen when people don’t fully consider their implications. He and a cousin had done genealogy together for years, when the cousin decided he wanted both of them to do DNA. He pushed Bill, who didn’t understand the implications, until Bill agreed, and after his cousin had his results, Bill did his, the results going first to the cousin. The results showed his father wasn’t his father, which, to put him mildly, threw him for a loop. The current issue of NEHGS’s “American Ancestors” has an excerpt from the book, and an interview with Bill about his further research, and how he now feels about DNA research. A couple of years ago, my siblings and I discussed asking our mother to do her DNA–she was the last of her generation, before her recent death at 100. We decided that first, she’d refuse, and second, it wouldn’t be ethical because she wouldn’t understand the reason for doing it. It was unfortunate that this didn’t come up five years ago, but it didn’t. Now all we can do is work with our own and our cousins’ DNA, being careful about the ethical issues involved.